This Duramax Diesel V8 project is so Cool. What is it? Petrol or diesel engine? Great job done by one of our customers running this Duramax Diesel V8 running it on one of our diesel ECU systems. Loads of new thing I’m working on. Hope to post some soon. Brands Hatch last semi truck race 2018. manage to get all the trucks we done on the podium. The newcomer Flying Dutchman Race team running the Volvo truck with the D13 engine manage to get 3e place and first time podium for this team as well. We changed the final drive on this truck so it run max speed @ lower RPM as this still stock engine dos make a load of torque @ low end so no need to chance gears if your engine will pull it easy making faster track time as well. Detroit 60 series of CMG bint racing still running strong but it’s getting old so looking into a low weight modern power house producing less smoke. Don’t get me wrong plenty of power if you turn up fuel but it will smoke a bit more. What can you say. It almost looks to easy. Almost no smoke and easy from the start hitting power exactly on the spot pulling away towards a 12.7 sec ¼ mile. What is this creation? It’s a Volvo truck with a D12A 12L engine 3 turbochargers and a automatic gearbox. The control of this all is done by one of our diesel ECU systems. Boost torque and even shifting the gearbox is done by the ECU and the good thing is they done it all them selves. All I gave them is a base setting for there engine making good power and some pointers on how the shift gears. How much does the truck weigh? Good question. No idea. A FIA race truck is 5200Kg min weight so maybe 7000Kg as for more weight on the rear. Also they make the runs with only 1100Hp so wonder what will happen if they use the full 1600Hp but OK this truck is new so they take it slow for now. Onboard the race truck of team Flying Dutchman. It’s a new team and fist time out in the UK and as you can see B class racing is very competitive. One mistake and you can start all over overtaking but that’s racing. What we have done is chance the final drive so they hit 100 Mile hours @ lower RPM getting better acceleration from 140 to 160Kmph now pulling a flat line up in RPM as before in bend down a bit after 140Kmph in all this can take 10 meter more to get to max speed where the speed limiter kicks in governing speed @ 0,2Kmph using GPS speed in the process. Maybe 4500 kg like drag trucks from Malta. Start working in the wire loom for the CAT C15/18. Thing is we only run them as a marine engines and I think and hope that some of the 2 pin plugs like for timing and temp sensors are different as I get 2304011 parts number on a marine engine and according to the information on a truck engine I get the 1552069 part number for the same sensors conector/plug. Hope to get some info on this. Last edited by tall boy; 11-15-2018 at 06:24 AM. You may be seeing that the marine engine has dual cam sensors, or at least they are listed like that in SIS. With marine engines there is an extension on the timing sensors the 1552069 is on the sensor but cannot be removed as a thing they use glue and on the extension there is the 2304011 plug so is this the same on CAT truck engines? 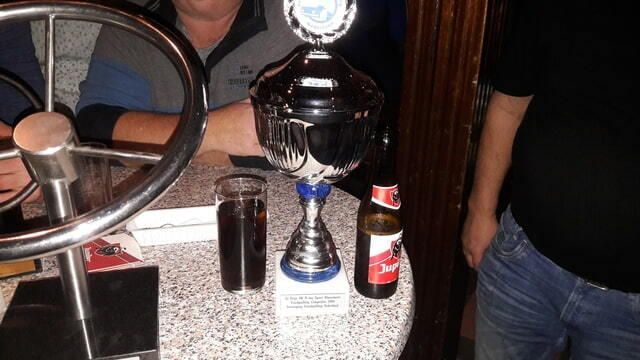 Last night it was the party night of VTN truckpulling, and with that also the award ceremony. Sports Truck Ny Titan Volvo van Dijk 3x times class champion in 2018 5 points and 2 meters short during the last battle for points in Meeuwen to win the championship 2018. For the coming year, the necessary changes are planted on the engine with the aim of less smoke and more power. Necessary test work on that parts is on it’s way. Needs some fine tuning on idle as this engine run the data set from our truck puller with a load more fuel delivery per injector and this engine as it’s stock and set @ 800Hp for now. Not a lot of time to post things. Working very hard to build A class truck race engines. Not easy to explain what a A and B class engine is as a B engine can be an A class engine depending on the fuel system and engine management and turbocharger. A class engine is build around a FIA 62mm inlet restriction in front of the turbo compressor giving it >6000Nm torque and about 1135Hp max. Also new this year is that we start renting out ECU systems to race teams giving the driver more options on controlling engine power. Traction control is not allowed but over the years we came up with some data on what traction will the racetrack provide under different conditions and this is implement in the control strategy inside the ECU system. Also spend a lot of effort on getting more fuel out of the Euro6 Volvo commonrail injector also used by Renault and Mack as it the same 13 or 16L engine. 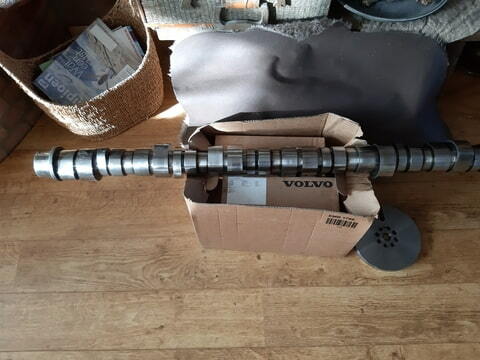 This camshaft is from a D16G Volvo engine and will be used for making a blank camshaft so we can build a billet camshaft for these engines later on. Just a day in the office testing some stuff. Scania V8 Hotrod making a run in the dark. Back to the 130mm bore size for this year so from 16.4L to just over 17L by fitting a different crank. Need some more pics of that hotrod! I could do without those wheels but that engine setup is badass and the exhaust sounds cool. Is the lope on purpose?